Antigua and its sister island Barbuda are both surrounded by a large number of well-preserved coral reefs. Diving or snorkeling in the warm and crystal clear waters of Antigua and adoring the underwater wild life and beauty of a lot of different corals and shipwrecks are a real treat. Swimming with yellow snappers and impressive stingrays or discovering lobster, nurse sharks and colorful parrot fish in a water temperature that averages 80 F or 25 C is simply heaven. Tropical marine plants and animals are diverse and plentiful and there are numerous reefs that invite you to snorkel and dive. 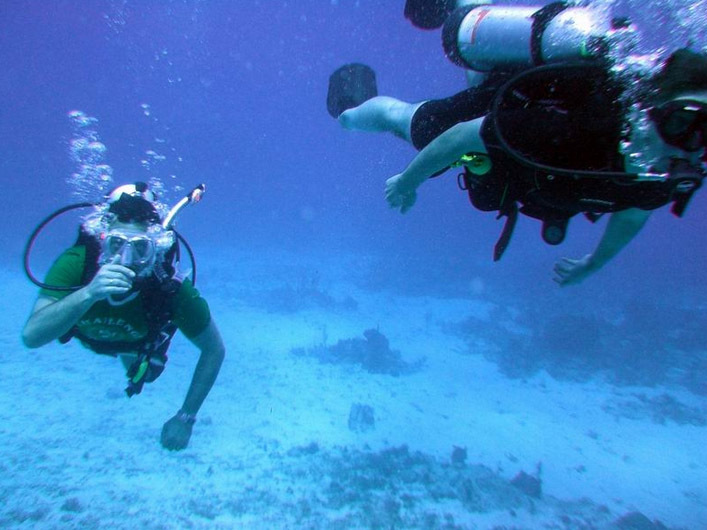 Antigua has lots of diving schools and facilities spread around the island that are easily accessible. Just check with Douglas and he will show you the best diving locations or snorkeling spots on island, and how to get there from Yepton Estate Cottages. A great way to combine a self catering vacation with a great diving and snorkeling experience in the Caribbean. Where Are The Antigua Golf Courses Located? Enjoy a great time with bird watching in Antigua! Booking Antigua for your next vacation!